Polymer science has established as a leading important interdisciplinary scientific stream emerging from Chemistry. Polymer science involves every aspect of understanding associated with natural or synthetic macromolecules. This vital branch of science encompasses chemistry, physics, mathematics, biochemistry, thermo dynamics, energetics and multi-faceted engineering applications as integration with the core subject. Innumerable applications of synthetic or bio-polymers are available in daily life and in industry. Continuously growing necessity for novel polymeric materials and its novel applications raised the need for a common communication podium for the researchers, academicians and students involved in polymer research. 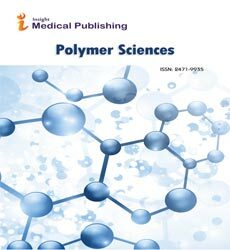 Polymer Sciences provides such unique opportunity to the academic community to publish their novel and outstanding research outcome in this very subject. Articles are accepted in the form of a research article, review article, short communication etc. Aims & Scope: This periodical aims to aid the research community in the polymer science with updated information related to the various aspects of polymer science. Articles which are cross disciplinary in nature are most welcome for publishing in this journal. Considering the vast interdisciplinary readers, it is anticipated that communication by the authors should be understandable by the readers pertaining to other associated discipline. Subjects considered for this journal contains bio-organic or inorganic polymer chemistry, macromolecular investigations, research on organometallic compounds, studies on mechanistic and energetics relevant to the polymers, supramolecular chemistry, assembly and reactions, theoretical studies on polymer including multiscale modeling and other simulation analysis, Electrochemistry and optical activity of polymers, crystallization of polymeric or oligomeric compounds, physics associated with macromolecules etc. Submissions not mentioned in this section but associated and relevant with polymer science are also welcome. Biodegradable polymers - Biodegradable polymers are the polymers which are easily degrade in the environment [or] Biodegradable polymers are also called as eco-friendly polymers. Cellulose - Cellulose is an organic compound with the formula (C6H10O5)n,a polysaccharide consisting of a linear chain of several hundred to many thousands of β(1→4) linked D-glucose units.Cellulose is an important structural component of the primary cell wall ofgreen plants, many forms of algae and the oomycetes. When two or more different monomers unite together to polymerize, the product is called a copolymer and the process is called copolymerization. Copolymers that are obtained by copolymerization of two monomer species are sometimes termed bipolymers, those obtained from three monomers terpolymers, those obtained from four monomers quaterpolymers, etc. Commercially relevant copolymers include acrylonitrile butadiene styrene (ABS), styrene/butadiene co-polymer (SBR), nitrile rubber, styrene-acrylonitrile, styrene-isoprene-styrene (SIS) and ethylene-vinyl acetate, all formed by chain-growth polymerization. Commercial examples formed by step-growth polymerization are the nylon-12/6/66 copolymer of nylon 12, nylon 6 and nylon 66, as well as the copolyester family. Cyclodextrins are produced from starch by means of enzymatic conversion. They are used in food, pharmaceutical drug delivery, and chemical industries, as well as agriculture and environmental engineering. Drug delivery systems – It refers to approaches, formulations, technologies, and systems for transporting a pharmaceutical compound in the body as needed to safely achieve its desired therapeutic. Elastomers – They are amorphous polymers existing above their glass transition temperature, so that considerable segmental motion is possible. At ambient temperatures, rubbers are thus relatively soft (E~3MPa) and deformable. Their primary uses are for seals, adhesives and moulded flexible parts. Flame retardants– Flame retardants are the compounds which are used to prevention of spreading fire. Forest Chemistry – Forest chemistry deals with natural products which are available from forest resources. Friction – It is the force resisting the relative motion of solid surfaces, fluid layers, and material elements sliding against each other. There are several types of friction: Dry friction resists relative lateral motion of two solid surfaces in contact. Graphene is a semi-metal with a small overlap between the valence and the conduction bands (zero bandgap material). It is an allotrope (form) of carbon consisting of a single layer of carbon atoms arranged in a hexagonal lattice. It is the basic structural element of many other allotropes of carbon, such as graphite, diamond, charcoal, carbon nanotubes and fullerenes. It can be considered as an indefinitely large aromatic molecule, the ultimate case of the family of flat polycyclic aromatic hydrocarbons. Graphene has many uncommon properties. It is the strongest material ever tested, efficiently conducts heat and electricity, and is nearly transparent. Graphene shows a large and nonlinear diamagnetism, greater than that of graphite, and can be levitated by neodymium magnets. Ionic Liquids - An ionic liquid is a salt in which the ions are poorly coordinated, which results in these solvents being liquid below 100°C, or even at room temperature (room temperature ionic liquids. Nanocomposite is a multiphase solid material where one of the phases has one, two or three dimensions of less than 100 nanometers (nm), or structures having nano-scale repeat distances between the different phases that make up the material. The idea behind Nanocomposite is to use building blocks with dimensions in nanometre range to design and create new materials with unprecedented flexibility and improvement in their physical properties. Natural polymers – polymers which are occurred from natural sources are called as Natural polymers. Oil and Gas– In oils saturated and un saturated compounds are deals with polymer sciences as well as different type of chemical gasses like methane ,ethane etc…, type of gasses also deals with polymeric sciences. Plasticizers – combination of plastics with any other materials for the purpose of softening are called as plasticizers. Polymers nanotechnology – polymers which are manufactured by mainly wet synthetic materials, There the different types of polymers are together to form nanoparticles. Polyesters - Polyesters are the compounds which are having main ester functional group in them. Polyethylene or Polythene (abbreviated PE; IUPAC name polyethene or poly(ethylene)) is the most common plastic. The annual global production is around 80 million tonnes. Its primary use is in packaging (plastic bags, plastic films, geomembranes, containers including bottles, etc.). Many kinds of polyethylene are known, with most having the chemical formula (C2H4)n. PE is usually a mixture of similar polymers of ethylene with various values of n.
Stabilizers – The materials which are having the capacity of keep stable the respective necessary agents are called stabilizers. Surfactants – compounds which are acts as to reduce the surface tension are called as surfactants. Thermoplastics - It is defined as a plastic material, polymer, that becomes pliable or mouldable above a specific temperature and solidifies upon cooling. Polystyrene (PS) is a synthetic aromatic hydrocarbon polymer made from the monomer styrene. Polystyrene can be solid or foamed. General-purpose polystyrene is clear, hard, and rather brittle. It is an inexpensive resin per unit weight. It is a rather poor barrier to oxygen and water vapour and has a relatively low melting point. Polystyrene is one of the most widely used plastics, the scale of its production being several million tonnes per year. Polystyrene can be naturally transparent, but can be coloured with colourants. Uses include protective packaging (such as packing peanuts and CD and DVD cases), containers (such as "clamshells"), lids, bottles, trays, tumblers, disposable cutlery  and in the making of models.